Bullies at school — what is the right solution? Bullies have been a problem since Cain killed his brother Abel. All of us remember who the bullies were in school, and who was being bullied. Some of us, myself included, experienced bullying first hand. (Yes, “mean girls” existed even in the 70’s, and it wasn’t fun). School professionals, who see these problems first hand, have been accused of standing by and doing nothing. So in the last few years, many districts have tried to develop programs to prevent bullying, with varying degrees of success. If we are honest, we instinctively know that teaching kids to run to teachers for help in these situations is not likely to help in the long run. School can be a tough environment socially, and there are lots of skills to be learned. I didn’t learn some of these early in my life, and to be honest, it has made me overly avoidant of conflict even to this day. 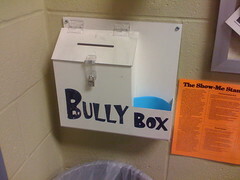 So I was very intrigued to come across Dr. Izzy Kallman’s website called bullies2buddies.com. It is devoted to teaching children the skills they need to handle themselves in school when being bullied. He has a lot of great material on the website, and if you are willing to sign up for his newsletter, he provides a link to three very informative manuals, one for kids, one for parents and teachers, and another on racism. What is especially interesting to me in digging deeper is that apparently he takes a lot of criticism from teachers and those in my profession for his stance. But parents seem very pleased with his information, and that counts for a lot with me. Take a look at a recent blog post of his to see one parent’s reaction to the results his child achieved by using Dr. Kallman’s methods. I have always believed that the secret to high self-esteem and confidence is having a true sense of one’s own competence. The more I have learned to do for myself, the better I feel. I see in children around me, in my own children as they were growing up, and in the families with whom I work. I think this approach to bullying makes sense, and I invite your comments.